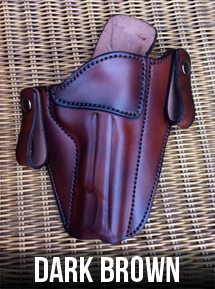 The 'Notus' Custom Leather IWB Handgun Holster by Soteria Leather is small and compact, much like a summer special. 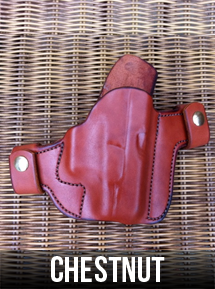 This concealed carry holster is designed for warm weather wear, or for individuals that only want a small amount of leather inside the waistband. 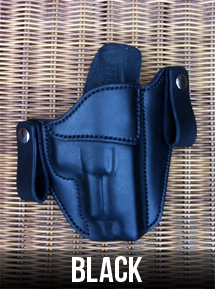 Your concealed gun will stay close to your body, which provides you with excellent handgun concealment. 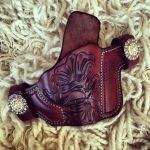 A reinforcement piece is stitched on the front of the holster, which provides easy re-holstering, as the mouth of the holster stays open. The Name: Notus was the Greek God of the South Wind and Summer. 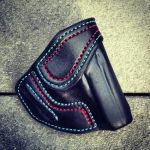 The Notus custom holster is available for the following weapons AND MORE. Please check the Weapon List. NOTE: If you do not see your handgun listed in the Weapon Option List, please send us an email at support@concealedcarrypro.com, as it may be available, or available soon.